The Apostles’ Creed: I believe in God, the Father Almighty, maker of heaven and earth; And in Jesus Christ his only Son, our Lord; who was conceived by the Holy Spirit, born of the Virgin Mary, suffered under Pontius Pilate, was crucified, dead, and buried; the third day he rose from the dead; he ascended into heaven, and sitteth at the right hand of God the Father Almighty; from thence he shall come to judge the quick and the dead. I believe in the Holy Spirit, the holy catholic church, the communion of saints, the forgiveness of sins, the resurrection of the body, and the life everlasting. Amen. In the 1950s, the journalist Edward R. Murrow had a radio program called “This I Believe.” For four years, millions of Americans heard people as famous as Eleanor Roosevelt and Jackie Robinson, and as unknown as cab drivers, teachers, and secretaries describe the guiding principles of their lives. Amidst the threat of nuclear war, increasing consumerism, eroding spiritual values, racial division, and suspicion that anyone could be a Russian sympathizer, Murrow hoped that his program would help bring people together around common and shared beliefs. 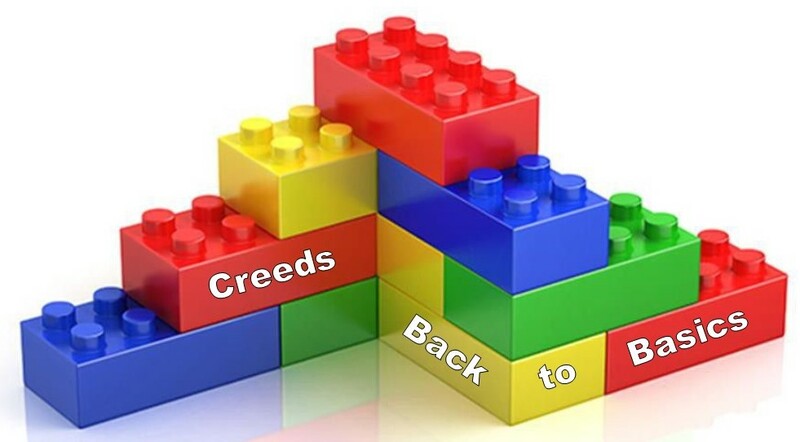 We didn’t always have set creeds. God didn’t tuck a how-to manual for creating a religion inside Jesus’ swaddling clothes in the manger. The beliefs embodied in our creeds developed over a long period of time. And they weren’t easily arrived at, and they were the product of conflict and rivalry that would be rated “Mature Audiences Only” if the story were made into a movie. But our creeds do have their roots in the very earliest days of the Church. Our passage from the 1st century Letter to the Hebrews hints at an early creed, or confession—possibly the one they used around baptism. By the 2nd century, an early version of our Apostles’ Creed was being used in Rome and the western centers of the Church. The churches in the east, centered in Jerusalem, Egypt, and present-day Turkey, had their own versions. As the Church grew and was challenged about its teachings, it needed to come to a consensus about what it believed. For the next two hundred years, there was controversy and debate around things like whether Jesus was actually God and whether our physical bodies are good or evil. Finally in the year 325, church leaders adopted the Nicene Creed. But 50 years later, in the 9th century, controversy erupted again over a single added word. To avoid taking sides, the pope others who wanted to avoid conflict began promoting the use of the Apostles’ Creed alongside the Nicene Creed. Later on, use of the Apostles’ Creed was supported by Martin Luther, John Calvin, and the Church of England (where the Methodist Church has its roots). Each word and phrase was carefully chosen. The creeds were not just statements of faith for believers. They were also written to defend specific doctrines that were under attack. The words of the Apostles’ Creed that we accept as obviously true carry meaning far beyond what we read on the surface. We begin by saying that we believe in God the Father. In the ancient world, these words would have reminded believers that God is the ruler of all, much like human fathers who held all the authority and power over everyone in their households: wives, children, servants, and slaves. These words were actually somewhat subversive, because they suggested that powerful human fathers did not actually hold the ultimate power as they thought; God did. But our creed also affirms that God is not a distant God, with no concern or involvement in human life as some believed in ancient times (and still do today). God is like a good father, who watches over and provides for his children. We believe in a God who transcends human beings but loves us and provides for us each day. When we say that we believe in a God who is Almighty and the Maker of Heaven and Earth, we affirm that there are no limits on God’s power, and that all things—physical and spiritual—are created good and under God’s control. In ancient times, some people believed that the physical world, including our bodies, was an evil thing to simply be endured until the spirit was freed at death. They thought that physical matter was rebellious and outside God’s influence. Our creeds deny this thinking. God created all things and called them good. Our bodies are good. Creation is good. And God has power over all of it. There is no separation between our “faith lives” and our every-day lives. Things of heaven matter, and things of the earth like economics and politics and human suffering matter. We affirm that the whole of our lives, material and spiritual, are our “faith lives.” God the Father Almighty, maker of heaven and earth, cares for and has power over it all. The Apostles’ Creed then moves on to Jesus Christ, God’s only Son our Lord. Today there are many people who think Jesus was a great guy but doubt whether any human being can be called the Son of God. Our creed makes it clear that we do believe Jesus is indeed God’s son, come to fulfill God’s good intentions for the world. But the early Christians had other concerns as well. They needed to make it clear that Jesus was the son of the Creator, the Son of the One God of Israel, and not some alien god. They needed to make clear that Jesus was God’s only son—unique and extraordinary. And they needed to make clear that Jesus was the fulfillment of all God’s promises to the Israel. There is no discontinuity between the God of Israel and the God of the Church. This is important for us to remember today. Many people today want to cast our Jewish neighbors as outcasts, sometimes in evil ways by so-called “Christian Identity” hate groups, including some right here in Ohio. When we identify Jesus as the Christ—the Messiah—we are accepting the connection between Christians and Jews. Since Jesus is the fulfillment of God’s promises to Abraham, if we claim that the faith given to Abraham is false, then everything we believe falls apart. So we affirm that Jesus is the Christ, the anointed one, the Messiah, promised to Israel. We also believe that Jesus is our Lord. We say that so easily, but for the ancient Christians, this was a radical and even treasonous claim. In a world where total obedience and loyalty to the emperor was required, and the emperor was considered a god to be worshipped, claiming Jesus as Lord could get you killed. Many who refused to reject Jesus as their Lord were tortured even unto death. This is still the case in some places in the world today. The words we speak so casually are words that have meant, and can still mean, the difference between life and death. But even with the freedom we have to speak these words, do we live them? Do we really place Jesus above family and friends, above patriotism and nationalism, above allegiance to anything or anyone but Jesus? Or do we allow Jesus to be Lord of a few hours a week and give the rest over to other lords? Our creed challenges us to wrestle with this question. The creed speaks to what we believe about Jesus’ earthly life: that he was conceived by the Holy Spirit, born of the Virgin Mary, suffered under Pontius Pilate, was crucified, died, and was buried. Affirming that he was conceived by the Holy Spirit affirms that he is God’s son. In ancient times, it was believed that the mother didn’t contribute any traits to her baby. She was simply the soil in which the seed grew, and any similarities to her could be explained in the same way we explain why corn tastes differently depending on the field where it’s grown. Specifying that Jesus was conceived by the Holy Spirit affirms that he is God’s son, with all the traits of his Father. Jesus was born of the Virgin Mary. This identifies his birth was a miracle, like many of the history-changing births in Israel’s story—births to women thought unable to have children. But, the radical thing about Jesus being born of the Virgin Mary is not that Mary was a virgin, but that Jesus was born—born like all human babies, slippery, crying, powerless, out of the pain of labor. In a time when some people argued that Jesus wasn’t really human but just a spirit wearing a human disguise, to state that Jesus was born affirmed that Jesus was indeed fully human. Jesus suffered under Pontius Pilate, a real person in a specific time and place. In a terrible error by the Roman and Jewish authorities, Jesus was crucified. He suffered, died, and was buried—all things that happen only to human beings, not spirits. All these events affirm Jesus’ humanity—humanity he shares with us. And the good news is, the Easter victory is not over! Jesus is alive even now, sitting at the right hand of God. And, because he was human like us, he invites us to sit there with him. Not so that we will become divine like him, but because God loves us so much that we are invited into the very heart and life of God, through Jesus. As we come to that place, Jesus will be our judge, looking into our hearts to see what he finds there. That can be a scary proposition, because we usually equate judgment with being judgmental. But Jesus will judge us with both love and justice. Justice means that everything is in its proper place, in proper relation to everything else. Justice acknowledges the good as well as confronting the bad. And we know that the throne of judgement is occupied by one of us, someone who has borne the same kind of burdens and pain we suffer. God’s justice, enacted by Jesus, is the product of God’s great love for us. From Jesus the creed turns to the Holy Spirit and what the Spirit makes possible: the holy catholic Church, the communion of saints, and the forgiveness of sins. We are not alone in this world! Jesus told us that he would send us an advocate, companion, and teacher, and he did. The Holy Spirit binds us together as the Church and makes it holy. Many people would question how holy the Church is, given the many failings of its people. But the Church is not holy because of the people in it. It is holy because the Holy Spirit is in it, and it has been set apart for God’s purposes. The Spirit makes the Church holy, and through the Spirit it is catholic—made up of people from every place and time, bound together in the communion of saints—the fellowship of believers who are empowered to share all that we have been given, and to both accept our own forgiveness and extend forgiveness to others. The creed concludes with the resurrection of the body and the life everlasting. In ancient times, belief in a physical resurrection set Christians apart from other faiths and from people who felt that death was a welcome escape from an evil material world. Instead, our creed returns to an affirmation of material life as a good gift from God, and points to resurrection as the fulfilling of God’s intentions for all that God has created. When we claim life everlasting for both body and soul, we are reminded to care now for the bodies we have been given, as we await their resurrection on that day to come. But, what do we do when we find we can’t, in all honesty, agree with everything in the creed? Based on our personal experiences, we may not feel comfortable calling God “Father.” In the face of evil in the world, we may question just how powerful God really is. We may have other doubts and questions that make us reluctant to say the creed at all, or at least make us mumble when we get to the problematic parts. The scholar Justo González tells a story about a young priest who had some problems with parts of the Nicene Creed. His advisor told him, “Recite it anyhow.” This continued for several weeks, with no change in the young priest. He asked his advisor why he kept repeating the same instructions. The advisor replied, “Because it is not your creed. It is the creed of the Church. When you recite it, you are not directly saying what you believe. You are declaring what the Church believes. And you are declaring yourself part of that Church, no matter whether you believe every point of doctrine or not.” When we recite our creeds, we’re not simply getting back to our own personal basics. We’re getting back to the basic beliefs of the Church Universal, across space and across time, and we are each a part of that Church. We’ve covered a lot of ground today as we’ve gotten back to the basics expressed in the Apostles’ Creed. But there is one more word I’d like to call your attention to. It’s the word “in.” It’s possible to believe—to think—that something is true. We can even believe strongly enough to stake our lives or reputations on it. But throughout our creed, we express our belief “in” rather than our belief “that.” We believe in God. We believe in Jesus Christ. We believe in the Holy Spirit and all that follows. When we say in our creeds that we “believe in,” we say something special about how and why we believe. We don’t believe simply because we’ve decided these things are true, though they are. Rather, we believe from within our place in God through our faith in Jesus Christ. Our whole lives are within God’s care, and it’s from within that place that we believe. As Paul said, it is in God—Father, Son, and Holy Spirit—that “we live and move and have our being.” We believe from within the Father’s love. We believe from within the human sphere that Jesus shared with us. We believe from within the Spirit’s power. We believe all that our creed says. But, more importantly, we believe in it. Amen.